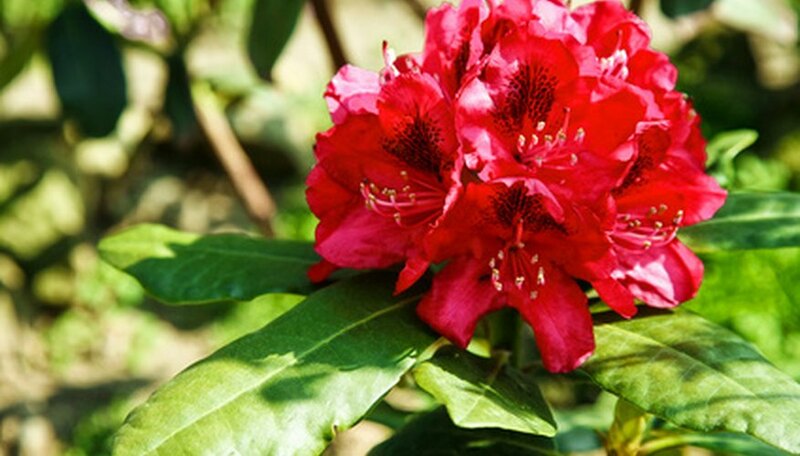 Rhododendrons are poisonous and can kill animals and even people if the plants are eaten. Whatever the reason, if you have rhododendron bushes and want to kill them, there are many methods to do so, including drowning, starving and poisoning them. However, in the winter, rhododendrons are not actively growing, and your choices are limited. Digging them up and discarding them is then the best method to get rid of them. Do this before the ground freezes or wait until it thaws and is workable again to kill your rhododendron bushes during the winter months. Saturate the soil with an inch or two of water a couple days before you plan to dig it up. This will make it easier to dig; however, skip this step if temperatures are below freezing. Dig a circle around the perimeter of your rhododendron. The bulk of the roots are as wide as the plant’s canopy, so dig as wide as your bush. Dig only about 4 inches deep. Cut in toward the center of your plant. If you feel the root ball, dig a couple inches deeper before cutting in. The goal is to get as much of the rhododendron’s root ball as possible. Lift the bush out of the soil. You may need help with this step since a rhododendron bush, plus the roots and soil surrounding them, can be extremely heavy. Brush off as much soil as possible and haul away your bush. Take it to your local yard waste facility or burn it if you are permitted to do so in your town. If you leave it be, it will survive and continue to grow in the spring, even out of the ground.